They say robots will one day serve mankind - in which case you can consider this an entrée. For if you pay a visit to this restaurant, in downtown Harbin, China, you will find 18 robots - from a waitress to a cooker to an usher - ready to ensure your dining experience is perfect. The restaurant has 18 types of robots, each gliding out of the kitchen to provide your dish, with specialty robots including a dumpling robot and a noodle robot. When a diner walks in, the usher robot extends their arm to the side and, with a sci-fi flourish, says ‘Earth Person, Hello, Welcome to the Robot Restaurant.’ After the diners have ordered, the robots in the kitchen set to work cooking. 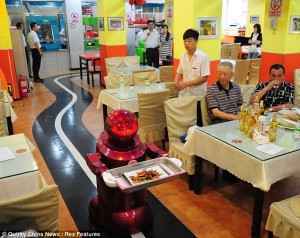 Once the dish is prepared, a robot waiter, which runs along tracks on the floor, carries it from kitchen to table. Prepared dishes are placed on a suspended conveyor belt and when the plate reaches the right table the mechanical arms lift it off and set it down. As they eat, a singing robot entertains diners. All the robots in the restaurant were designed and made by the Harbin Haohai Robot Company. Chief Engineer Liu Hasheng, said they invested 5 million Yuan (about £500,000) in doing the restaurant, with each robot costing 200,000 to 300,000 Yuan (around £20,000 to £30,000). He comments: ‘Staff in the computer room can manage the whole robot team. ‘After the busy times during the day, the robot will go for a “meal”, which is electricity’. Liu added that after a two-hour charge the robot can work continuously for 5 hours. The restaurant now provides a menu with more than 30 dishes, and for the average cost for a diner is £4 to £5. More than a dozen robots operate in the restaurant as entertainers, servers, greeters and receptionists.